a free 5″ pattern to paper piece! Today I’d like to share something that’s kind of special to me in an unusual way. 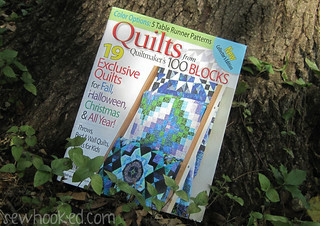 I’m sharing this post on Sewhooked and on Fandom in Stitches, both of my quilting blogs, something I rarely ever do. There’s a good reason for the unusual post, promise! As many of you already know, about five years ago, I was contracted to design a book full of magical Sunbonnet Sue patterns. Sadly, the book was never published. Despite that setback, I eventually designed almost 60 Sue patterns. Those patterns became the backbone of my pattern company and blog, Sewhooked. There’s an entire page of free and for sale patterns on Sewhooked! Hogwarts Sue was never part of the book idea, but she was inspired by the theme and is a pattern from The Good Old days before Fandom In Stitches existed. Back then, all my patterns were free and were shared through to Sewhooked and Harry Potter Paper Piecing. 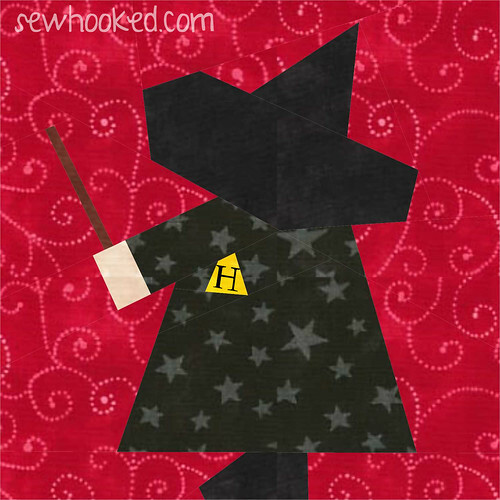 Hogwarts Sue has been retired for quite some time and Harry Potter Paper Piecing is now Fandom In Stitches. It’s time for me to welcome back Hogwarts Sue. She’s a little bit Sewhooked and a little bit Fandom In Stitches. To celebrate this sweet coming together of my two blogs, I’m giving away a free set of your choice from Sunbonnet Sue’s Magical Friends to one person that makes Hogwarts Sue and posts her to the Fandom In Stitches flickr group and/or Sewhooked flickr group! You can only win on one time, but you’re welcome to double your chances and share with both groups! Winner to be announced Tuesday, September 17, 2013. Find Sunbonnet Sue’s Magical Friends sold in sets and individually on Craftsy! This entry was posted in Craftsy, paper piecing, Sunbonnet Sue and tagged magical friends, sunbonnet sue on September 11, 2013 by Jennifer Ofenstein. Oh, yes please! I’d love to see that combination! Thank you for another free pattern. I have many of your patterns on my wish-list which I intend to purchase when I can find a job.